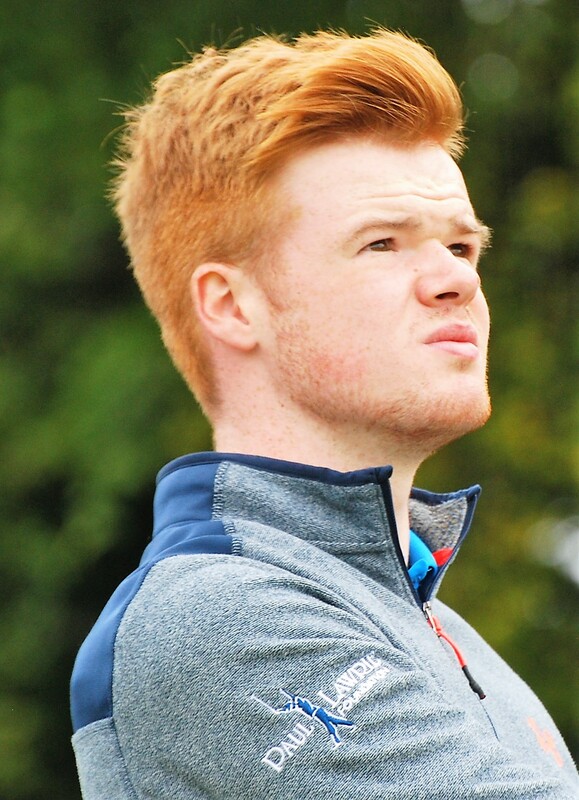 The 97th Scottish student golf championships got off to a testing, blustery start at Moray Golf Club with as around 130 of the finest college and university players beginning three days of stroke-play competition at the Lossiemouth links. Play got underway for the men at 9am at which time the westerly wind was only in the thirties mph. However, by mid-morning the players were contending with very strong gales indeed, making it treacherously difficult to navigate the tight lay-out of the New Course at Lossiemouth. Stirling University’s Michael Lawrie, pictured left, younger son of former Open champion Paul, held the clubhouse lead at +3 for a spell, weathering a double bogey at the fifth and finishing neatly with birdies at 14 and 17. Indeed the concept of weather was an ever-present concern for the plucky student golfers, with intermittent hailstorms adding yet more piquancy to an already testing day. Play was suspended for a time mid-morning while a brutal hailstorm briefly took hold – and further squally showers were to be a feature of the day. Thankfully though, the strong winds would ensure that even the worst conditions were only of a fleeting nature. There was impressive shooting from Oliver Bailey (Stirling), who birdied the seventh to help him get to the turn in level par. This imperious form was to continue well into the back nine, the highlight of which was a magnificent eagle at the par five 14th. He was left with a tap-in putt for his 3 after almost holing out for an albatross. The winner of the recent West of Scotland Trophy student event, Jordan Sundborg (Stirling), amazingly carded no bogeys at all en route to a five-over-par round of 75. Having absorbed double bogeys at the first, sixth, 12th and 13th, he dug in extremely well and finished with three birdies over the last five holes to post a 76. Sundborg finished the opening day in a tie for fourth with St Andrews’ Peter Kerr, one shot ahead of James Blyth (St Andrews), who tidily carded 14 pars on his way to a four-over par round of 74. The women’s championship, with a field of 18 students, began on the Old Course at mid-day. In the first group Stirling’s Chloe Goadby got off to a strong start. In conditions that troubled even the hardiest campaigners, she made it to the turn in three over the card before accelerating on the back nine to return a commendable score of one-over 76, thanks to birdies at the 11th and 16th. Team-mate Penny Brown had to tough it out after a difficult start, falling to plus four after the first five holes. However, a birdie 2 at the sixth provided some relief and from there she held firm to recover to a total of two-over 77, featuring back-to-back birdies at 13 and 14. Jasmine Mackintosh of Robert Gordon University showed great resilience when, having slumped to +7 after the first five holes, she rallied hard to play the following 13 holes in level par. She posted an 82, alongside Emily Laws and just behind Mirren Fraser (both Stirling) – all of whose rounds followed a similar trajectory of gritting teeth after a tough start. Play at Lossiemouth resumes from 07.30 on Monday as the full field of men and women take to the New Course, harbouring ambitions of making the cut ahead of the final 36 holes on Tuesday. For up to date tournament information stay tuned to @ScotStuGolf on facebook and for tee times and scores check out GolfBox. H and I = University of Highlands and Islands. 77 C Franssen (St Andrews), M Napier, R Foley, A McNaughton (UHI), A Reid (Strathclyde), E Ferguson (UHI). 78 A Woodhouse (Strathclyde), W Squires (SRC), M Bell, R Watson (Strathclyde), M Friel (Strathclyde), A McDougall, J Keating (Aberdeen), L Johnson (UHI).